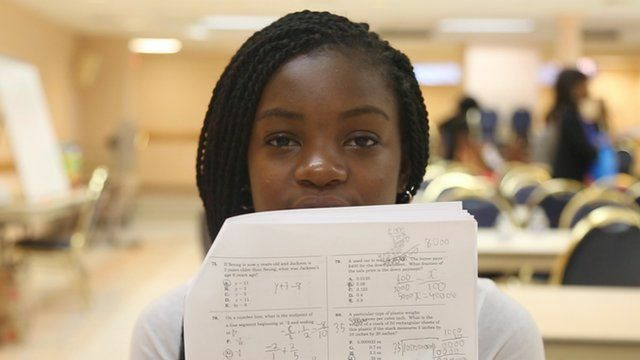 The test to get into top NY schools Jump to media player New York students tells the BBC why they're spending the summer studying for the city's toughest high school test. School security: 'We go through jail life' Jump to media player High school students in Washington, DC discuss how daily security measures in their schools affect their educational experiences. Being a Muslim cop during Ramadan Jump to media player Going to prayer during Ramadan with the head of the NYPD Muslim's Officers Society. Are cameras holding police to account? Jump to media player A year after Eric Garner died after an encounter with police, his family have received a $5.9m payout. Are cameras holding police to account? US rap duo reflect on Ferguson riots Jump to media player Acclaimed rap band Run The Jewels talk to the BBC about racism and why they think the Ferguson riots were important. Students in New York City are preparing for the "test that can change their lives" - the entrance exam for the city's top high schools. Many spend their summer studying for the test - including at hundreds of prep centres across the city. 27,000 students tried last year and only 5,000 made it. Anna Bressanin spoke to two groups who have given up their summer to study - the children of Bangladeshi immigrants, who typically do well on the test, and African-American students in Brooklyn, who make up only 5% of those matriculating at top schools. Could you get into New York's top high schools? Try some test questions here.